Design For A Difference projects don’t just happen overnight. And like planning a voyage to sail around the world, there are many ways to go about it. The journey takes months to conceptualize, organize, implement and execute, and relies upon the expertise of a variety of skilled contributors. For Design For A Difference, this includes sponsored charities, IDG showrooms, designer teams, local businesses, industry partners- even grass-roots friends and family within the community to lend a helping hand throughout the process. And at the helm of every project sits a team of support at the corporate level of IDG (International Design Guild), who tirelessly keep everything in check from the start to finish of every makeover. They are there to answer questions, make connections, and facilitate a smooth execution between showrooms and suppliers, and support everything from timelines to social media, and even rolling up their sleeves during installation week to ensure a successful reveal. Meet Chelsea Demers – IDG Business Consultant , Michelle O’Brien – IDG Business Consultant, and Andrea Mummau – VP of Soft Surface Buying of CCA Global Partners (IDG parent co). 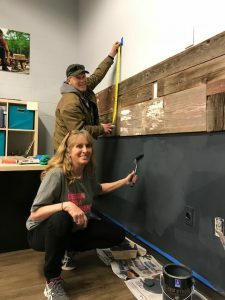 Today, we’re asking them to share their favorite makeover moments over the last five years as well as how Design For A Difference has impacted their view of design and giving back. HG: What’s your favorite moment of your Design For A Difference experience? CD: Meeting Fran [Heitzman] from Bridging in Minneapolis and watching his reaction at the reveal was a definite stand-out moment for me. 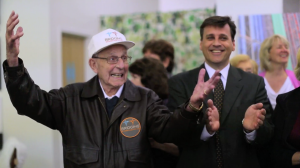 The look on his face was absolute pure joy, and one you just don’t see day to day. And I’d have to say that this is my favorite moment from each of the projects. Experiencing someone’s joy makes everything worth it every time. MO: The reveal at Operation Breakthrough: The tears of joy that came over so many people taking in the reality that they had a brand new space was absolutely overwhelming; the only thing I can compare it to is giving birth to a child. There was a sense that they’d been validated. That what they had been doing for decades was important; and they deserved to work in a space that was beautiful and served their needs. I think the joy expressed at every reveal is something you can’t re-create and it captures the purpose of what we hoped Design For A Difference could be from its conception. AM: I wouldn’t say that there was one defining favorite moment- I think it was just a whirlwind of “mini-favorite” moments, if that makes sense. I loved getting to know so many people on different levels and from different backgrounds; it just culminated into this beautiful thing of everybody being there for the same reason; and that’s what made it so special. HG: What surprised you most about the makeover process? CD: Just how much people rallied together, how much there is a need for it, and how much it changes those people involved… its kind of an unexpected consequence of doing this. When these teams get together, they know they want to help the charity, but they never realize that by helping them they are impacting an entire community. MO: With each and every makeover we have done to date, I am most surprised by the generosity of donations, assistance and support from the surrounding community, suppliers, vendor partners, family and friends of all involved. Just when we are all feeling that the wants or needs to pull off a project seem to be a bit out of reach, we get some amazing additional support at just the right time to make it all happen. Experiencing a design team’s vision come together is priceless. AM: Maybe it surprised me that so much could be done in such a little amount of time! I guess when you have that many hands doing so many different things it’s amazing what can happen- and I think that’s true about life, right? Think about our forefathers: They did not have any of the technology that we have, but they had a lot of hands. People came together to help each other all the time. That’s the only way that things got built. And I think that’s cool to think about as we’ve lost a lot of that in today’s fast paced rat race. Maybe that’s why there’s a swell of this type of thinking and this type of movement. People are seeing that even though we’re connected digitally online, they are feeling less connected. I think these opportunities allow people to come together and feel [I believe] what we were intended to do: To be connected and to do things together and support each other. HG: How has your makeover experience changed the way you think about design? CD: I guess before Design For A Difference I had never thought of design impacting as much as it does. Like actually physically changing somebody’s mood or just how they feel about their environment… I always thought of design as something really pretty that you look at and see in a magazine, but I never thought that it would change people’s outlooks on how they are working and playing in their everyday life. MO: I have a greater belief in how a designer utilizes their conversations with clients to make their space ideal for them. It has really opened my eyes to the amount of effort, planning, and thought that a designer puts into their work- especially when they truly listen to the client. This level of intake is happening on a much deeper level. They hear certain things, and take elements like a memory from childhood or family history, or whatever it may be, and use them to inform their work to create the most personalized design I’ve ever seen. It’s those things that now, seeing first hand through all the design projects and meetings I’ve sat in on, that have changed my view about it all. The way our designers process information to create the perfect space is just mind blowing. AM: It definitely makes you think about making things that are not only fun and beautiful, but that are practical and long lasting. You think in terms how things will get used and how it will look in two years and in five years. HG: And how has your Design For A Difference experience changed the way you think about giving back? CD: It’s really inspiring to see these people selflessly giving their time and talents, and it makes you think about unique and different ways to give back besides just writing a check. Being part of all these makeovers has made giving back something that I want and need to do on a regular basis. MO: It’s changed everything. Before, I’d give dollar amounts. But now it’s really changed how my family gives back- especially during the holidays. Now we actually purchase Thanksgiving meals and buy the gifts on a family’s wish list when the holidays come around. We benefit from spending more time together as a family and it’s become a special part of our life. Not only that, I’ve personally ramped up throughout the year by becoming a big sister in our Big Brother Big Sister program at CCA Global. So giving back to my little sister has been kind of one of those other great “give backs” that doesn’t take a lot of time and or money, but is just helping to guide her. And I credit Design For A Difference for instilling this within my spirit. 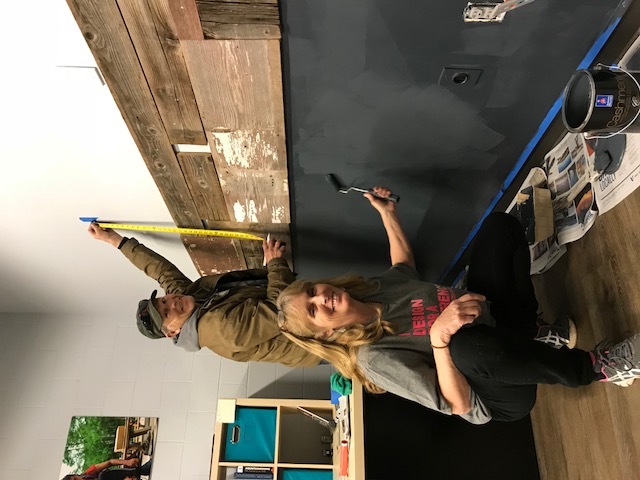 AM: I believe that if you have a heart for service, it’s always there, and it’s basically what ignites that fire for you… and for me, being a part of the makeover at Operation Breakthrough in KC was just an amazing experience. The fact that those two sisters [Sister Corita Bussanmas and Sister Berta Sailer, founders of the charity] started something so long ago, and when they did, they did it out of love and didn’t know what would come of it… I think that’s the beauty. The beauty is that we don’t really know initially how what we do will give back. And that what’s so cool. HG: Andrea, we couldn’t agree more. There is tremendous beauty behind every Design For A Difference makeover, from start to finish. And we are grateful that in addition to our IDG showroom owners, our corporate staff have embraced the movement with happy hearts. Thank you for all your support. To experience your own magical moment, check out our latest videos at www.designforadifference.com.